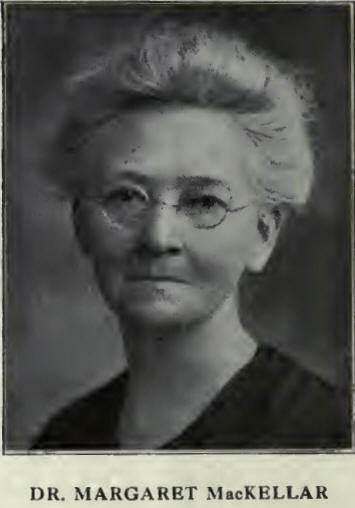 WHEN Dr. MacKellar was on furlough in 1913, at the Whitby Conference, she was led to lay aside her usual reserve and tell of her conversion and call to the mission field. Many were touched by the account and one who was present wrote a sketch of Dr. MacKellar for "Everyland," adapting it to children, but, as the account was written largely from memory, there were a number of inaccuracies. Dr. MacKellar had often been told that she owed the recital of her leading to others, and that some day it should and would be written. So when it happened that three of us went together to South India for our vacation, it seemed as if the time and opportunity had come for the preparation of the narrative. She told all the facts and they were written down, but with the liberty of a friend and admirer. Dr. MacKellar first became known to me in 1890, when I was aspiring to be what she had become—a medical missionary. Since coming to India, in January, 1902, I have been rather closely associated with her. It is not the aim of this little sketch, however, to take up the tale of her splendid work in India, but rather to tell and amplify the story that was heard with appreciation at Whitby. May the reading of it be a call to some young people of our church to offer for like service, and may it encourage any who are daunted by difficulties to see how God's help and a strong will can overcome them. Thanks are due to Miss Coltart for her collaboration in the preparation and for copying the manuscript. IN Neemuch, Central India, to-day, there stands a splendidly planned and equipped hospital. Within its walls sick women and children are given the treatment and care best calculated to bring them back to health, and to one and all the Gospel of the Grace of God is preached by word and deed. The solid strength of the building, with its orderly arrangement and capacity for helpfulness demonstrates to a large circle something of the character of the woman of whose lifework in India it crowns. In the sketch before us, the emphasis is laid on the formative years of Dr. MacKellar's life. Its purpose is mainly to show how God laid hold of her dedicated life and led her along through a series of "determinative choices" into ever enlarging opportunities of service in His Kingdom. Naturally of a strong unyielding disposition, her girlhood was distinguished, as she often recalls, by tempestuous encounters with the will of one who occupied a position of some authority in the home. But this very quality of firmness, when brought into harmony with the good and acceptable and perfect will of God, has been a powerful factor in her career, and has made her what she is to-day, a leader in all that pertains to the advancement of Christ's Kingdom in India. And her methods have been those of her Master, as they were summarized recently by a London Minister, i.e., compassion, prayer, hard work. It was compassion for souls that led her out into paths of Christian service, that at one of the decisive moments of her life constrained her, when she heard the needs of the Christless multitude in distant lands, to cast her all into the treasury and later, to give herself to the great missionary venture of faith. And from the beginning of her Christian life fellowship with God in prayer has been interwoven with the fibre of her being. After the initial, deliberate choice to go back to school it was sheer hard work and determination not to give in that led her through the strenuous years of preparation for life-service as a medical missionary. Withal she has not forgotten how to play! It was a revelation during a summer vacation, to see the readiness with which she entered into friendly relationship with the small son of the home, a sunny boy of independent spirit. She "popped" rose leaves with him, and made little toy boats and vessels and snakes from the tissue wrapping of sweets. Though farthest removed from him in years, she was the one in our company who seemed to get nearest him in spirit. The same capacity for enjoyment which made her a popular member of society in her girlhood makes her still a welcome addition to any gathering. She has an endless fund of amusing anecdotes and conundrums, and a happy gift of repartee; she can be serious with the serious, and yet enter into the pleasures of the merry hearted. This is a side of her character which perhaps has not been dwelt on in the sketch of her life, but it should not be passed over. Of Margaret MacKellar it may be truly said, that having sought first the Kingdom of God, "all these things" have been added unto her.